I so enjoy reading a good book. I’ve wondered if writing would be as enjoyable? I make up fun characters and stories if I can’t do anything else (traffic, planes, etc) just to entertain myself. Would it transfer over as a usable skill or should I stick to reading? As much as I read, I can’t get enough “new blood” that I’m interested in reading. I value your opinion. Do you have a list of your book available on MP3? I’ve been enjoying the Twitter posts from Fallon Jones. Are those going to be integrated into a book? Or are they teasers for future books? In particular I am thinking of today’s mention of the “illusion talent in Seattle” who gave Fallon chills. Are you given a page limit by the publisher? Are any of your characters loosely based on someone you know? If so, can you tell us who and why? As a talented and prolific author, who has been involved in the romance field for 30 years, what style trends you have noticed? I’ve always been rather curious about the public disdain for romance as a genre, and how defensive women who read them must be to remain intelligent in the public eye. I’ve never understood why a book needs to be depressing and disturbing to qualify as literature. Why do you suppose that is? Have you felt the need to defend your career to others? Are you ever approached with the opinion that you could be a “real” author if you stopped focusing on romance? Of course, perhaps at this point you’re universally respected, but how about earlier in your career? Are there some books or forums you might recommend to me for a more academic discussion on the romance genre? published in the future. Any tips for me? What attracted you to writing Victorian era romances? What is the hardest part about writing in the Victorian era? Which book would you consider to be the best to recommend as an introduction to Jayne Ann Krentz/Amanda Quick? I was just wondering if you will be writing any new books as JAK that are not in the Arcane series. When will your next Jayne Castle book come out? Has Nikola Tesla featured prominently in your research? Perfect Poison is Book 6 in the Arcane series, but there’s a new series coming out that’s a continuation of the Arcane series that’s not called the Arcane series but the Dreamlight Trilogy? Does that mean the first one is going to be Fallon’s story, or is that an entirely different book? And why isn’t Dark Light considered part of the Arcane series (or at least mentioned)? Is Obsidian Prey going to continue the revelation of the Arcane Society on Harmony or was that a one-shot head-nod to the AS fans, sort of like you did with the Cabinet of Curiosities in After Dark as a nod to Lie by Moonlight? Is Midnight Crystal in the Harmony series or something totally different? Since you have so intricately woven the thread of psychic abilities throughout your books, I was wondering if you have any. If so, what? And if not, what attracted you so to this area? I just finished RUNNING HOT. Will there be more in the Arcane Series? Are the Jayne Castle books a part of the Arcane Series? Why was Jones & Jones established? Will we be seeing more of the Arcane Society on Harmony? Are there going to be any more books in the Ghost Hunter Series? Are there any women hunters in the Arcane society? I wonder because you still have applied more traditionally “feminine” talents to the female characters in your books. I would really like to see a female hunter. Have you heard from the ‘daughters’ of Vanza?? I believe there is more to come out of the school then just well bred young ladies. Is it possible we may meet any of the girls trained in the art of Vanza in future books? Will you write anymore under the Amanda Quick name? 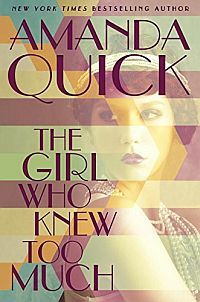 How did you choose the pen name Amanda Quick? Is Charmed out of print? Do you have any plans to write more books like SWEET STARFIRE? I was wondering if Jake, who I read about in Dark Light, would have a story in the future. Will we ever see Lavinia and Tobias or Miss Emmaline and Anthony again? Where did you get the idea for the dust bunnies? Will Caleb Jones, the founder of Jones & Jones, the Arcane Society’s psychic investigation agency ever get his own story? Will you be writing Fallon Jones’s story? Do you have plans for a signing in CA? Do you have plans for a signing in Savannah, GA? Do you have any Seattle area book signings planned for this summer? Q: Are you given a page limit by the publisher? There is no page limit but most authors develop a natural length when it comes to telling a story. That length is usually a product of their style. My books are dialogue driven rather than narrative or description driven. A book that is heavy on dialogue, by its very nature, tends to be a tad shorter. I write with an emphasis on dialogue because that is the way the story comes to me — through the voices of the characters. Q: Are any of your characters loosely based on someone you know? If so, can you tell us who and why? I never base characters on anyone I know. The people in my stories come out of my head, not off the street. But having said that, I do try to give my characters interesting problems and quirks that feel at least somewhat realistic. Q: As a talented and prolific author, who has been involved in the romance field for 30 years, what style trends you have noticed? Great essay on the changes in romance (see Discussions tab on Facebook Page). Thanks for taking the time to write it. There isn’t room to respond to all of your comments here but I’ll take a shot at a couple of your questions. First, I would like to point out that it is impossible to nail down style and story trends in this field. This is a genre that is constantly experimenting and reinventing itself. That is one of the reasons I love writing it. Q: I’ve always been rather curious about the public disdain for romance as a genre, and how defensive women who read them must be to remain intelligent in the public eye. I’ve never understood why a book needs to be depressing and disturbing to qualify as literature. Why do you suppose that is? Have you felt the need to defend your career to others? Are you ever approached with the opinion that you could be a “real” author if you stopped focusing on romance? Of course, perhaps at this point you’re universally respected, but how about earlier in your career? It’s true that the romance genre traditionally has not been highly respected. But it turns out that the authors in other classic genres such as mystery, suspense, thrillers, science fiction, fantasy, etc., sense the same lack of respect. Just ask ’em! The bottom line is that genre fiction, in general, is not highly regarded by the literary and academic establishment. That is because our kind of fiction gets its power from the ancient, heroic archetypes and storytelling traditions — not modern angst. In genre fiction, the characters are troubled and flawed, just as they are in modern literary fiction. But in genre fiction, the heroes and heroines don’t take the victimhood approach to life. They are expected to overcome their problems with the ancient, heroic virtues: courage, determination and a belief in the healing power of love. In the end, they must do the right thing. They are not allowed to whine! Q: Are there some books or forums you might recommend to me for a more academic discussion on the romance genre? Q: I’m an unpublished author, writing eco-thrillers/thrillers, and hope to get published in the future. Any tips for me? I don’t know if your book contains any romance but if it does, you might want to check out Romance Writers of America. It is a fabulous writers organization that has a lot of useful information for both published and aspiring writers. Authors in genres outside romance (suspense/thriller/paranormal and urban fantasy writers) tell me that they find it very helpful. If you live in the Northwest (Washington, Oregon, etc.) you should take a look at joining Pacific Northwest Writers Association. Best of luck to you in your writing! Q: What attracted you to writing Victorian era romances? I chose the Victorian era for the Arcane stories that take place in the past because the fog-and-gaslight atmosphere seemed a perfect landscape for a secret society dedicated to the study of the paranormal. Q: What is the hardest part about writing in the Victorian era? Describing the women’s clothes! They wore so many of them. A well dressed lady might leave the house wearing nearly forty pounds of corsets, petticoats and heavy skirts. That is why my heroines are all members of The Rational Dress Movement (which actually existed). The RD Movement’s goal was to get rid of corsets and lighten the weight of female attire. Their motto: No lady should wear more than seven pounds of undergarments. Don’t laugh. It was considered very progressive, very feminist thinking at the time. Fallon is a real name, believe it or not. I found it in a “name the baby book”. That is where I get most of the names for my characters. Let me tell you, there are some very odd names in some of those books! The thing about names for characters is that they have to feel “right”. There’s just a click when you find the perfect name. Q: Which book would you consider to be the best to recommend as an introduction to Jayne Ann Krentz/Amanda Quick? RUNNING HOT is a great intro to my JAK world. THE PERFECT POISON will open the door to my Amanda Quick historicals. Both combine the three elements that I love working with: romance, suspense and a psychic twist. Q: I was just wondering if you will be writing any new books as JAK that are not in the Arcane series. Not for a while. This series has really taken off and I’m committed to it for the foreseeable future. The Arcane “world” will soon be expanding, however. In January 2010 you’ll meet, Jack Winters, the contemporary descendant of an alchemist who was a mortal enemy of the founder of the Arcane Society. Watch for FIRED UP, the first book in the Dreamlight Trilogy featuring the Winters men early next year. Q: When will your next Jayne Castle book come out? The next Jayne Castle title is OBSIDIAN PREY. In it you’ll meet a future descendant of one of the characters in my current JAK title, RUNNING HOT, (Harry Sweetwater). The Sweetwaters are a close-knit clan of professional assassins. Let’s just say that not much has changed for the Sweetwater family in the future on Harmony. Oh, and the name of the heroic dust bunny in this one is Vincent. He’s got an artistic streak. Q: Since you have so intricately woven the thread of psychic abilities throughout your books, I was wondering if you have any. If so, what? And if not, what attracted you so to this area? I love working with the psychic element because it adds a wonderful layer of intimacy and connection between the hero and heroine. I also like it because it allows me to do some interesting things with the plot. I think of psychic talents as being just “one step beyond” intuition. I don’t claim to have any paranormal talents but I do have a sense of intuition. I think most people believe that they have some degree of intuition. That’s what makes it possible for readers to step into my Arcane world. Q: I just finished RUNNING HOT. Will there be more in the Arcane Series? Yes! The Arcane Society now incorporates all three of my worlds: contemporary (written as Jayne Ann Krentz), historical (written as Amanda Quick) and futuristic (written as Jayne Castle). Each book can be read as a stand-alone but I hope that readers who follow me into all three worlds will get a kick out of learning about the Society’s past, present and future. Q: Are the Jayne Castle books a part of the Arcane Series? The first three books of the Harmony series make no mention of Arcane. I never intended to link Harmony to Arcane. But I discovered that I couldn’t resist. What can I say? Arcane has taken over my life! So, starting with SILVER MASTER there is a hint of Arcane on Harmony and in DARK LIGHT, we discover that, yes, some members of the Arcane Society made it through the “Curtain.” You’ll be seeing more of Arcane in the next Harmony story, OBSIDIAN PREY (coming in August 2009). Q: Why was Jones & Jones established? In the Victorian era the Master of the Arcane Society, Gabriel Jones, (meet him in SECOND SIGHT) realized that the Society needed a private investigation agency not only to protect Arcane’s darkest secrets but also to protect the public from dangerous rogue psychics. Gabriel’s cousin, Caleb Jones, was given the task of setting up the new agency. You’ll find out how he got his partner and how the firm acquired its name in THE PERFECT POISON, # 6 in the Arcane Society series. Q: Will we be seeing more of the Arcane Society on Harmony? Q: Have you heard from the ‘daughters’ of Vanza?? I believe there is more to come out of the school then just well bred young ladies. Don’t worry, you’ll be hearing from a daughter of Vanza soon! I loved doing that story (LIE BY MOONLIGHT under my Amanda Quick name) and I’m so glad you were intrigued enough to ask about those young ladies. Q: Is it possible we may meet any of the girls trained in the art of Vanza in future books? Vanza was one of my early attempts to sneak a mysterious, secret society into some of my books. In fact, it was one of the inspirations for my Arcane Society series. Vanza, as I conceived it, is a mysterious martial arts philosophy. The heroes in three of my Amanda Quick books are members of this clandestine group (I THEE WED, WICKED WIDOW, and LIE BY MOONLIGHT). In the last story, LIE BY MOONLIGHT, I ended the book with the hero and heroine teaching the arts of Vanza to a school full of orphaned girls. And in answer to your question, we might, indeed, meet one of the young women in a future book or at least one of her descendants…. Q: Will you write anymore under the Amanda Quick name? Yes, indeed, there will be more Amanda Quick books. They are now part of the Arcane Society series. The newest hardcover is THE PERFECT POISON. It is Caleb Jones’s story. Caleb, you may recall, was the founder of Jones & Jones. The latest AQ paperback is THE THIRD CIRCLE. Q: How did you choose the pen name Amanda Quick? Ha! That was easy. I went into a bookstore and checked out the romance bookshelves. At the time there were very few writers under “Q”. Figured I’d have the entire shelf to myself, heh, heh. Sadly, that did not last long. I chose Quick because after a few years of watching publishers try to squeeze Jayne Ann Krentz onto a cover, I wanted something short. Q: Is Charmed out of print? I believe that CHARMED has been reissued. It is an anthology consisting of several novellas from a number of different authors. My story in it is Bridal Jitters. It is set on Harmony. I hope you enjoy it! Q: Do you have any plans to write more books like SWEET STARFIRE? I’m still doing futuristics like SWEET STARFIRE but these days I write them under the name Jayne Castle. My Harmony/Ghost Hunter series are novels of romantic-suspense set in the future on another world. You can find out more about the series by clicking on the Harmony link to the left. Q: I was wondering if Jake, who I read about in DARK LIGHT, would have a story in the future. Well, I hadn’t planned to give Jake his own story. But, like you, I found him a very compelling character. As it happens, he inspired one of the characters in the book that I am writing as we speak. In this story (a contemporary JAK Arcane Society novel) the heroine knows him as Mountain Man. I think that, for me, Jake is the archetypal “street wizard” — the one who helps illuminate the others in the story. Q: Will we ever see Lavinia and Tobias or Miss Emmaline and Anthony again? Probably not. I left that series as a trilogy because, frankly, it didn’t sell well. People stood in line around the block not to buy those books. I have since left that publisher. I can tell you, though, that it was doing Lavinia with her gift for mesmerism, that helped inspire my Arcane Society series. Q: Where did you get the idea for the dust bunnies? I love including animals in my books and in the case of the futuristics it is just too much fun to pass up. They add a whole different dimension to the story. The dust bunnies are particularly useful in my Jayne Castle books because they act as a bridge between humans and the mysteries of Harmony. They were actually inspired, in part, by a parakeet named Ferd who lived with us for ten years. There was something whimsical and clever and a little dangerous about Ferd. I think it was those dinosaur genes. He forever changed the way I view birds and animals in general. Q: Will Caleb Jones, the founder of Jones & Jones, the Arcane Society’s psychic investigation agency ever get his own story? Yes, and thanks for asking. Caleb gets his story in THE PERFECT POISON, # 6 in the Arcane Society series. In that book you’ll find out how Jones & Jones got its name. Q: Will you be writing Fallon Jones’s story? Q: Do you have plans for a signing in CA? Q: Do you have plans for a signing in Savannah, GA? Q: Do you have any Seattle area book signings planned for this summer? I won’t be touring this year, however, if you want a personally inscribed book you can order one from Seattle Mystery Bookshop. I will be happy to sign a copy of THE PERFECT POISON or THE THIRD CIRCLE or any of my other current titles for you. Just contact the store to reserve a copy. Makes a great gift! The friendly bookshop staff will mail the book to you. Q: I so enjoy reading a good book. I’ve wondered if writing would be as enjoyable? I make up fun characters and stories if I can’t do anything else (traffic, planes, etc) just to entertain myself. Would it transfer over as a usable skill or should I stick to reading? As much as I read, I can’t get enough “new blood” that I’m interested in reading. I value your opinion. Q: Do you have a list of your book available on MP3? Unfortunately, I don’t have a complete list but I can tell you that all of my current titles, including all of the Arcane Society novels are available on MP3. Also Brilliance Audio has picked up both my Amanda Quick and JAK backlist. They are releasing the books very rapidly in that format. Q: I’ve been enjoying the Twitter posts from Fallon Jones. Are those going to be integrated into a book? Or are they teasers for future books? In particular I am thinking of today’s mention of the “illusion talent in Seattle” who gave Fallon chills. There are no current plans to integrate Fallon’s Tweets into a book at this time. Right now, Fallon is tweeting about a local case that does not appear in any of the books, but some of the people he meets will be in FIRED UP this winter. Q: Are there going to be any more books in the Ghost Hunter Series? Yes, Book 6 in the Ghost Hunter series, OBSIDIAN PREY, is available. If you’ve been wondering where everyone on Harmony gets their tuned amber, you will be interested in meeting the heroine, Lyra Dore. She’s an amber tuner. Q: Are there any women hunters in the Arcane society? I wonder because you still have applied more traditionally “feminine” talents to the female characters in your books. I would really like to see a female hunter. In answer to your question, I haven’t done any actual female “hunter-talents” yet but just wait until you see what Chloe Harper, the heroine of FIRED UP, can do with her unusual talent. I think you’ll appreciate her self-defense capability! Q: Has Nikola Tesla featured prominently in your research? Tesla is a fascinating character. I have not done much research on him and I can’t quite see him as a hero in one of my books (maybe it’s the haircut). There’s a bit too much of the “mad scientist” vibe there. On the other hand, some of his theories certainly fit in neatly with Arcane Society research! Q: Perfect Poison is Book 6 in the Arcane series, but there’s a new series coming out that’s a continuation of the Arcane series that’s not called the Arcane series but the Dreamlight Trilogy? Does that mean the first one is going to be Fallon’s story, or is that an entirely different book? And why isn’t Dark Light considered part of the Arcane series (or at least mentioned)? Is Obsidian Prey going to continue the revelation of the Arcane Society on Harmony or was that a one-shot head-nod to the AS fans, sort of like you did with the Cabinet of Curiosities in After Dark as a nod to Lie by Moonlight? Is Midnight Crystal in the Harmony series or something totally different? Don’t worry, I sometimes have to stop and think about it too, and I write the series! In answer to your question, the Dreamlight Trilogy is part of the Arcane Society series. It incorporates one book from each of my pen names. Think of it as a “trilogy-within-Arcane”. No, it does not include Fallon’s story but you will definitely be seeing more of him. OBSIDIAN PREY, by Jayne Castle, brings the Arcane Society more prominently into the Harmony books. Readers of RUNNING HOT will recognize the hero, Cruz Sweetwater’s last name. From now on Harmony is officially a part of the Arcane world. And, yes, there are more dust bunnies on the way.